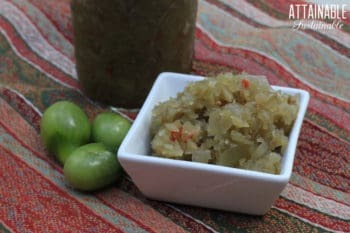 This green tomato relish is excellent as a condiment for meats, on hamburgers, and even as an appetizer with crackers. Passed down through generations, my family’s favorite chow chow recipe is a fantastic way to preserve end of the season green tomatoes. The old metal grinder is firmly mounted to my mom’s kitchen table, the abundance of our summer garden stacked in bowls and baskets around us. As often as I could, I’d take a turn at the grinder, cranking the handle despite my stinging, watering eyes. I watched as onions, bell peppers, and green tomatoes were pulled into the turning screw, a crunching sound coming to my ears over the noise of the squeaky handle turning. Mom hovered, sure that with every turn of the handle one of my tender young fingers might join the mix in the pot that was catching the crushed green vegetables. Clear juices, tinted green, dripped from every point of the old grinder, running down to my elbow and then to the floor where a large towel was ready to catch the overflow. The bright green pulp from the unripe remains of a bountiful harvest would be transformed into a relish with the funny name chow chow relish. As times have changed, so too have my methods for making this chow chow recipe. Nowadays, an electric food processor makes quick work of the unripe tomatoes, peppers, and onions to transform them into my family’s favorite green tomato relish. But while I am feeling nostalgic about the days I spent hand cranking the grinder in my mom’s kitchen, I share the details with my boys. I want them to know that this is a family recipe, one that my grandmother and theirs made, salvaging the last of the fruit from the vine before winter relegated them to the compost heap. Thirty-some years later, the green tomato chow chow recipe tastes the same and my eyes still water, though as I think back to my childhood I’m not sure if it’s the pungent ingredients or the memories that cause the tears. So many people pull their tomato plants at the end of the season, tossing the green tomatoes into the compost pile, right along with the rest of the plant. Staaaahhp! If there are still lots of green tomatoes on the vine as the first frost approaches, harvest those tomatoes! It’s time to make green tomato relish! This recipe is easy to make, but you will need to plan ahead. Once the vegetables are chopped they need to sit in the refrigerator overnight to release their juices. 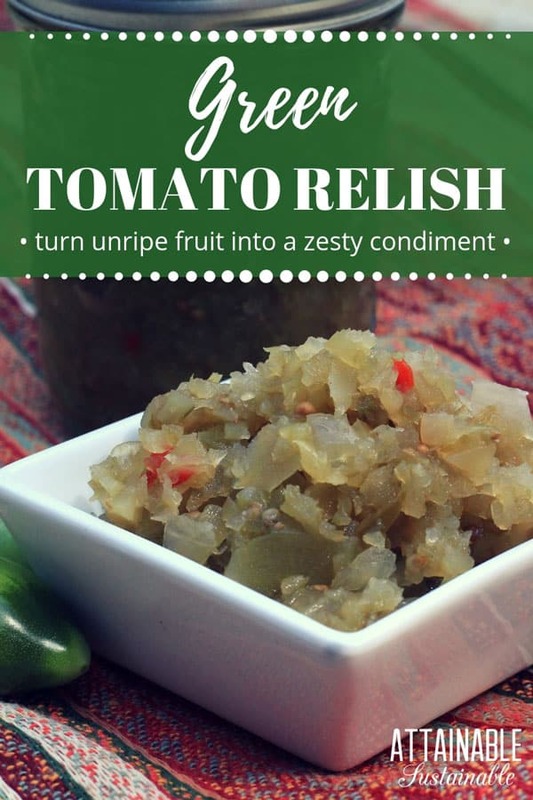 A food processor makes quick work of chopping the vegetables for this relish. Could you cut the veggies by hand? Absolutely — just aim for less than a quarter-inch dice and allow a bigger chunk of time to accomplish this task. This chow chow recipe makes about ten pints — plenty for your pantry and some to share with friends if you preserve it with a water bath canning process. This green tomato relish is excellent as a condiment for meats, on hamburgers, and even as an appetizer with crackers. In a food processor, chop tomatoes, onions, and peppers in batches, using the pulse mechanism. Stir together in a large stock pot. Sprinkle with the salt and refrigerate overnight. Drain off liquid and stir in vinegar, mustard and sugar. Bring to a slow boil; continue boiling until tender (about 15 minutes). 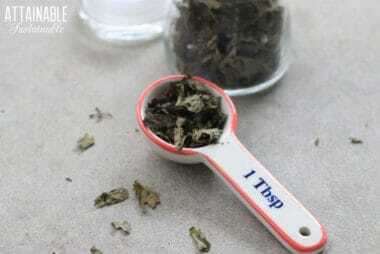 Pack into canning jars and refrigerate, or process according to safe canning methods. Makes about 10 pints. This chow chow recipe makes about ten pints. **Adapted from the Ball Blue Book of Food Preserving. **For more information about safe canning, contact your local cooperative extension office. I remember one year we had green tomatoes still coming on by Halloween, but this year, I had just enough left for a batch of fried green tomatoes appetizers. I hope next year to be able to do this! I have heard of chow chow, but never had it. Thanks for the recipe! Yum! Our tomatoes didn’t do very well this year — no one’s did, apparently — so I don’t have any green ones left. We ate them all! But I would love to try this recipe. And I’ve always wanted to learn how to can food! Ughhh, this *would* have been perfect for the lingering garden veggies… until the freak snowstorm on Saturday buried them all. Frozen tomato, anyone? What nice memories. This sounds like an awesome dish. I don’t recall ever making chow chow with them, but my grandmother and mother both had grinders like that. great story (and recipe). thanks for bringing back the memories. So good to know about this! Earlier this year we wound up with many green tomatoes and could have used this then…will remember just in case for next time! I have never made my own chow chow, but my grandmother and great aunt did. Although I didn’t appreciate it as a child, I’d sure like to have a jar of their chow chow now. I haven’t heard of chow chow, but I love the idea. 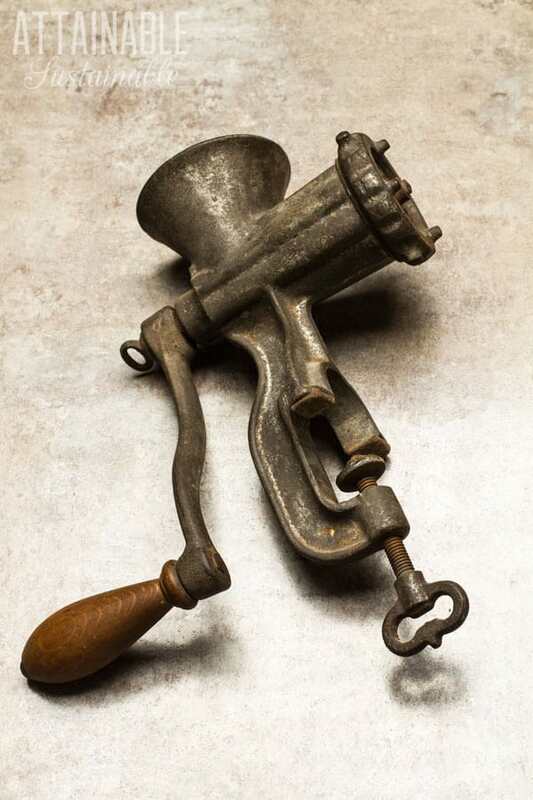 When I was a child my mom had a hand crank wheat grinder. Now I have one for my kids to use too. Know some local folks who are going to appreciate this recipe. Finally!!!!! My gram made chow chow using all the same ingredients as you. Unfortunately I wasn’t interested in canning when she was still canning (and the kitchen was off limits when her old temperamental huge canning pressure cooker was fired up. 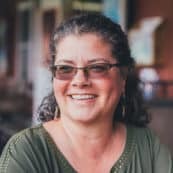 For the last several years I have looked for a chow chow recipe that looked like hers and had the same ingredients. THANK YOU THANK YOU THANK YOU for sharing your family recipe. I will tell your story when I make and pass out the jars of chow chow to the family and friends! I’ll sure try next year but I’m curious, to process or not ? I did a different recipe and put product into steril jars but the no processing I can’t get used to, comments please ??? Always process unless you’ll be refrigerating it and using it quickly. My mother made ChowChow every year but it was different than the ingredients you use. My mothers ChowChow won the West Texas State Fair twice. The difference was no hot peppers,(of course if you like it spicy use peppers) but mothers and now mine has cabbage also in it. Mothers recipe was handed down from her great aunt and her mother, so it is over 100 years old, and still outstanding. My hand written recipe makes about 30 quarts so it was a two day process to just grind all the ingredients. This next year I plan on entering ChowChow in the State Fair of Texas in Dallas. try adding some cabbage to your recipe. So easy to make and tasty! After letting the veggies set covered with salt you don’t rinse the veggies before you boil them? I’ve never canned and I don’t own a canning pot (I do have a Instant Pot not sure it that’s the same thing) but I can freeze with the best of ’em. 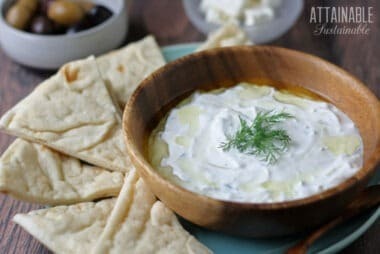 Can this recipe be made for freezing instead of canning? Instant Pots are not approved for *pressure canning. This recipe only requires water bath canning which can technically be done in any stock pot. My only concern with canning this would be that the texture might be a bit different than the canned version, but I can’t imagine it being *bad. Try it! My 85 yo mother still makes chow chow when she visits. She is very particular about getting as much fluid as possible out of the initial mixture. She lets it hang overnight in pillowcases to drain. You know, I remember my mom draining hers like that, now that you mention it! My family has been making this since I can remember , I am doing a batch now a little bit different but almost the same. My Chow is from Newfoundland & Nova Scotia where this chow is used almost daily ,. It stay,s good for a year or two . Enjoy & May God Bless.